Emergency lights and exit signs are an important part of any public space. Nearly every new construction requires at least an exit sign, and for good reason: A simple lighted sign above a door can save a life. Recognizing the need of their commercial clients to locate a trusted distributor of quality emergency lighting, 1000Bulbs.com has unveiled a low-priced, wide selection of LED exit signs and emergency lights. Any emergency lighting setup begins with the placement of exit signs, yet with the typical incandescent exit sign using 20 watts, this unassuming fixture can be a major cost for businesses. It follows that energy saving alternatives have become a serious contender in the market. Responding to this, 1000Bulbs.com now carries over sixty exit signs, all of which use LED technology. These next-generation signs use only 2 watts, signifying huge, long-term savings for customers. However, exit signs are only part of the Internet retailer’s newest product line. In addition to the signs, the company has added over forty emergency lights. Many of the lights can even be interconnected with exit signs as well as other emergency lights and remote light heads. 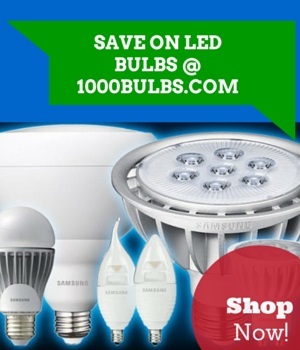 1000Bulbs.com also offers popular "combo" fixtures that combine an LED exit sign with two emergency light heads. The fixtures include ordinary thermoplastic units as well as heavy duty, wet location rated lights. Moreover, because aesthetics are a concern for any designer, 1000Bulbs.com chose to offer a wide variety of colors, housing types, and styles that will blend in with virtually any surrounding. The new exit signs are available with either red or green LED letters as well as white or black thermoplastic and brushed aluminum housings. High-end edge-lit options are also available. The emergency lights are available in styles and colors to match the exit signs. Finally, 1000Bulbs.com representatives note that exit signs and emergency lights, while invaluable, are only one part of an overall safety lighting strategy. With this in mind, the company also includes fluorescent emergency ballasts among their offering, along with a selection of replacement batteries for emergency lights. Realizing that a full remodel is not always possible for existing structures, the Internet retailer has also chosen to carry red and green LED retrofit bulbs for older exit signs. 1000Bulbs.com maintains this new selection of emergency lighting is in keeping with their long-established commercial lighting business. The company intends to be a "one stop shop" for any company looking to outfit their place of business with updated lighting technologies, offering everything from traditional lighting fixtures to electrical controls and safety lights.